A strongly feminine tree, Willow teaches us to take control of our destiny. It is associated with water, the Underworld, poetry and Witches and it strengthens intuition and gives inspiration. This beautiful lightweight wand is crafted from a willow root which is carved with an ogham scroll along its length. The wood is pale with warmer variations and graining, and wonderful energies. The willow is a strongly feminine tree and teaches us to take control of our destiny. It is associated with water, the Underworld, poetry and Witches and it strengthens intuition and gives inspiration. 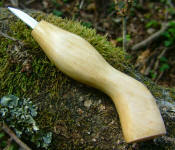 This beautiful lightweight wand is crafted from a willow root which has some wonderful colours and graining within it. The handle in particular is very tactile and has colours ranging from deep creams through to chestnut brown. It is finished with a quartz crystal tip. The willow is a feminine tree of death and rebirth and teaches us to take control of our destiny. It is strongly associated with water, the Underworld, poetry and Witches and it strengthens intuition and gives inspiration. This beautiful lightweight wand is crafted from willow wood which has a natural twist from growing entwined with wild vine. The warm, chestnut-coloured bark is left intact on the handle to contrast with the paler inner wood. This simple, slender wand is crafted from willow wood and is tipped with a quartz crystal which was charged beneath a full moon. The wood was carefully gathered at Swallowhead Spring, an ancient and revered site in the Avebury and Silbury Hill area of southern Britain. This wand can be shortened to your ideal length free of charge. This lightweight and simple wand is crafted from beautifully grained willow wood which features a natural twist formed by entwining with wild honeysuckle vine as it grew. The wand has a very magickal, Fae feel to it. Willow wood is strongly associated with water, the Moon, poetry and Witches and it strengthens intuition and gives inspiration. This rare, twisted wand is crafted from willow wood which was charged beneath a full moon. The wood is full of colour variations and graining and has been naturally twisted by entwining with wild honeysuckle vine as it grew. This beautiful wand is crafted from river willow which is naturally twisted, a very rare find with willow! The willow is a feminine tree of death and rebirth and teaches us to take control of our destiny. It is strongly associated with water, the Underworld, poetry and Witches and it strengthens intuition and gives inspiration. This wand is crafted from beautifully grained, naturally twisted willow wood - a very rare find! It has a moonstone inserted into the handle and an ogham scroll carved along its length.